OAAA has revealed the 115 contenders for the 2017 OBIE Awards. Celebrating its 75th anniversary this year, the OBIE Awards program is the oldest and one of the most prestigious shows in advertising, awarding creative excellence in the out of home (OOH) medium. In addition to multiple Bronze, Silver, and Gold OBIE Awards, OAAA will present the first ever Platinum OBIE Award, as well as four new Craft Awards. Additional categories this year honor OOH work that is contextual, engaging, experiential, and more. The 115 campaigns nominated this year demonstrate the importance of creativity in OOH, and many showcase the medium’s ability to offer a customized experience to capture audience attention. 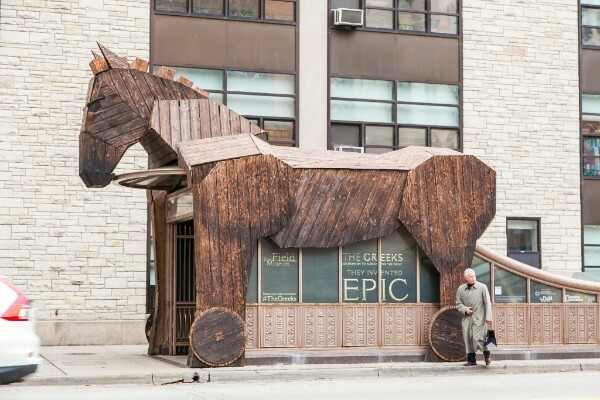 To promote its new exhibit on ancient Greek artifacts, the Field Museum installed a giant Trojan Horse encasing one of Chicago’s most popular subway entrances. The installation could not be missed as passersby snapped photos and tweeted about the experience. To demonstrate its vast travel network, American Airlines added a shadow to its logo flying over its many service locations. This “Shadows” campaign demonstrates how stunning imagery paired with a recognizable symbol can relay a powerful message. As technologies expand and improve, there are greater opportunities to personalize interactions with consumers. Google Home took innovation to great heights by installing the many impressive features the product offers into multiple transit shelters. Using a touch screen, the shelters allowed commuters to make temperature and lighting adjustments and select music. The 2017 winners will be announced at the OBIE Awards Gala on Tuesday, May 16. The event will be held as part of the OAAA\Geopath National Convention + Expo at Mardi Gras World in New Orleans, LA.